Still wondering why the efforts to conserve the 1,000 feet of Connecticut River frontage at the entrance to the Village of Walpole, New Hampshire? This video will answer your questions, show you this special property, and its importance. At the end of the video are details for sending your tax-deductible contribution either by check, or on-line with GoFundMe. Those details are also at the bottom of this page. 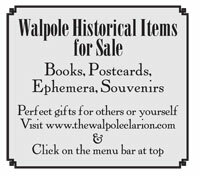 Click here on this link to access and read the Town of Walpole’s Zoning Ordinance and Master Plan. AS IT WAS…AND STILL IS – WALPOLE, NEW HAMPSHIRE, tours the reader through more than 125 years of history shown through 300 rarely seen images creatively displayed, all in full-color. Only $20 per copy. Available at Joanie Joan’s Baked Goods Company, The Walpole Artisans’ Cooperative, or call Ray at 603 756-4545. Mailing (domestic and international) available. Click on image for more details. Reopened for its 60th Anniversary in 2017, SANTA’S LAND is being restored. Click on this link for ongoing updates.